The map services listed on this page are the result of collaborations with students, faculty, and external partners. 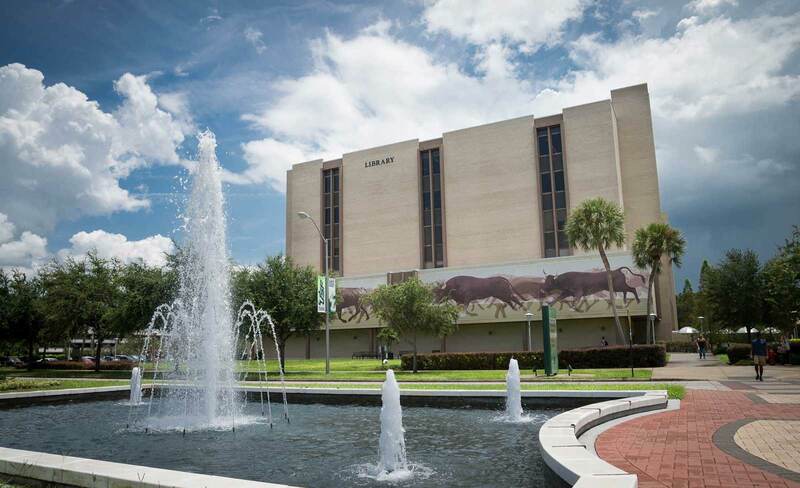 Each project is described and links to a map service hosted by the USF Tampa Library. Links to theses/dissertations and geodatabases are available on the map service site. This application is currently under construction. Please check back soon for more information about the project. To review the published reports written or collected by the group please select visit the Tampa Bay Area Study Group Project collection. Numerous research studies have been conducted on the modification of weather and local climate by the urban environment. In studying the urban environment effects, researchers have investigated the urban heat island (UHI), anthropogenic cloud condensation nuclei, anthropogenic heat emissions and other factors. Many of these studies used data sampling networks, while other studies relied solely on computer modeling. This research has taken an approach between the sampling network studies (which were often limited in spatial density) and the pure computer model studies (which lacked the benefits of observational data) to investigate the Tampa Bay Region UHI. The research utilized inexpensive commercially available temperature logging sensors within a 525 km2 study area. One hundred temperature logging sensors, deployed within the study area, generated in excess of 250,000 time and temperature data points for analysis. The large number of temperature sensors enabled the generation of detailed spatiotemporal maps of the Tampa Bay Region UHI. Analysis of the data revealed a significant relationship between the percentage of impervious surface in the study area and the intensity of the local UHI delta temperatures. In addition, the analysis identified the existence of micro UHIs within residential areas. These micro UHIs affected readings within the residential areas. In conjunction with the investigation of the relationship between the percentage of impervious surface and the generation of a UHI, wind speed’s role as a moderating factor was also investigated. It was found that increases in wind speed are correlated with a lessoning of the observed UHI. Wind speeds above approximately 2 ms-1 exhibit a significant negative relationship to the development of a UHI. The results of this study add to the field of UHI research in subtropical environments. The goal of this cruise is to investigate the impact of the BP oil spill on the northern Gulf of Mexico ecosystem, focusing on the lower end of the water column food web. Results from this cruise will be compared to observations and measurements of the marine ecosystem obtained during other cruises in the non-impacted region on the west Florida shelf. Spatially explicit ecosystem models of all types require an initial allocation of biomass, often in areas where fisheries independent abundance estimates do not exist. A generalized additive modelling (GAM) approach is used to describe the abundance of 40 species groups (i.e. functional groups) across the Gulf of Mexico (GoM) using a large fisheries independent data set (SEAMAP) and climate scale oceanographic conditions. Predictor variables included in the model are chlorophyll a, sediment type, dissolved oxygen, temperature, and depth. Despite the presence of a large number of zeros in the data, a single GAM using a negative binomial distribution was suitable to make predictions of abundance for multiple functional groups. We present an example case study using pink shrimp (Farfantepenaeus duroarum) and compare the results to known distributions. The model successfully predicts the known areas of high abundance in the GoM, including those areas where no data was inputted into the model fitting. Overall, the model reliably captures areas of high and low abundance for the large majority of functional groups observed in SEAMAP. The result of this method allows for the objective setting of spatial distributions for numerous functional groups across a modeling domain, even where abundance data may not exist. Pinellas County is located on a peninsula in Florida that experiences daily patterns of sea breeze associated rainfall mainly during the summer months of June through August. Previously, rainfall patterns, amounts and timing and severe weather in Pinellas County have not been examined considering dominant wind flow patterns, sea breeze circulations and other atmospheric variables. To improve forecasting of local mesoscale phenomena, this project examined the rainfall patterns, amounts and timing and severe weather occurrences that occur as a result of sea breezes and associated prevailing wind regimes within Pinellas County for the months of June, July and August for the years 1995-2009. Other atmospheric variables are also considered. Through the use of sounding data from the Ruskin, FL National Weather Service (NWS) Station, Pinellas County rainfall station data, and radar-estimated rainfall totals data from the NWS Advanced Hydrologic Prediction Service, the following meteorological parameters were examined: dominant wind direction and speed, stability (convective available potential energy, CAPE and CAPEV; CAPEV is CAPE calculated using virtual temperature). Composites were made of radar-derived rainfall estimates to show where the dominant rainfall occurs in relation to the sounding classifications of dominant wind flow for that day using ArcGIS as an analysis tool. Composite maps of precipitation indicate that the largest range of precipitation across Pinellas County occurs when winds are from the 241-300° direction category. The soundings were also used to classify days by CAPE, wind speed, and precipitable water. Precipitable water had a significant positive correlation with precipitation amounts in four of the five wind direction categories. Wind speed had significant positive relationships with a southerly wind direction. In order to examine the timing of rainfall associated with each wind direction category, Gr2Analyst was used. Gr2Analyst indicated rainfall occurred earlier in days featuring a westerly flow, and later in days with an easterly flow. Severe weather is also influenced by wind regimes and other atmospheric variables. Wind direction, wind speed, CAPE, precipitable water, and the United States Air Force Severe Weather Threat Index (SWEAT) indices were examined in relation to severe weather. The likelihood of severe weather was related to wind direction, with more events occurring during days with a more easterly flow than westerly. Atmospheric parameters were also examined in relation to each severe weather event. The Karst Information Portal (www.karstportal.org) is a digital library linking scientists, managers, and explorers with quality information resources concerning karst environments. We are currently working on a series of map services that will allow researchers to link published resources to geographic locations covered by those resources. The current map service describes the location and characteristics of a select group of springs in the state of Florida, all of which are covered by one or more resources stored within KIP. The USF Libraries’ Karst Information Portal team are collaborating with researchers from the USGS, the National Cave and Karst Research Institute, and the Nature Conservancy to establish a comprehensive map of the global distribution of karst. The concept was developed by Emily Hollingsworth, a graduate student working with Professor Van Brahana at the University of Arkansas. We plan to employ cutting edge cloud-based GIS technologies to make the content accessible to anyone with a connection to the WWW. For more information regarding the concept and Hollingsworth’s work to date, consult the USGS Scientific Investigations Report “Karst Regions of the World (KROW)” (http://www.karstinfo.org/node/10703) or Hollingsworth’s thesis (http://www.karstinfo.org/node/11227). Access to this map service is restricted at this time. Additional information concerning the project and the service will be published at a later date. This application is currently under construction. Please check back soon for more information about the project or go to the USF Digital Collections website for more information about the photo collection. More information about the Plant Species Catalog project can be found here.